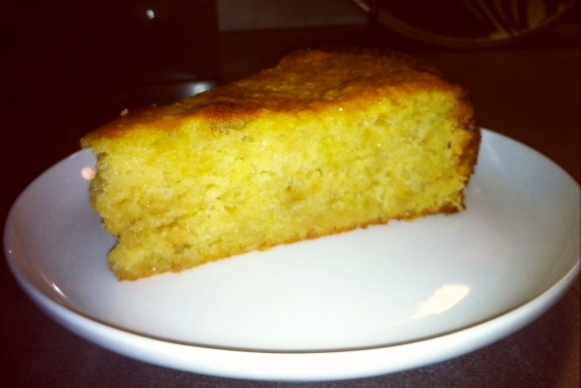 Bolo Polana, a Cashew and Potato Cake, is a traditional dessert in Mozambican cuisine. Polana is the name of a neighborhood in Maputo, Mozambique’s capital. This cake is a great example of the combination of Portuguese and Mozambique ingredients. The unique combination of cashews and potatoes yields a unbelievably rich cake with a smooth nutty flavor. 1) Heat the oven to 350° Fahrenheit and roast the cashews for 15 minutes on a baking sheet. 2) Once done and slightly browned, turn off the heat and let them cool. Meanwhile, in a saucepan, cook the potatoes in water covered for 20 minutes on medium heat. 3) Process the cashews in a food processor until it reaches a smooth and even consistency. Pour it into a bowl and set aside. 4) Once the potatoes have cooked and become soft, take them out of the saucepan and mash them well with a fork. Once they are well mashed and smooth, add them to the cashews in the bowl. 5) Place the sugar, butter, grated lemon peel, and flour in the food processor and blend until light and creamy. 6) Once well mixed, add to the potato and cashew mixture. 7) Now add the egg yolks one by one, constantly mixing. 8) Beat the egg whites and add them to the bowl. Mix it well. 9) Grease a baking mold and pour the batter into the pan. 10) Bake in the oven for 30 to 45 minutes at 355 degrees Fahrenheit, or until the top has become golden brown. 11) Once done, let the cake cool for about 10 minutes and remove from the mold. Serve at room temperature. this is a bit different from what we make in goa. but loved this one better.